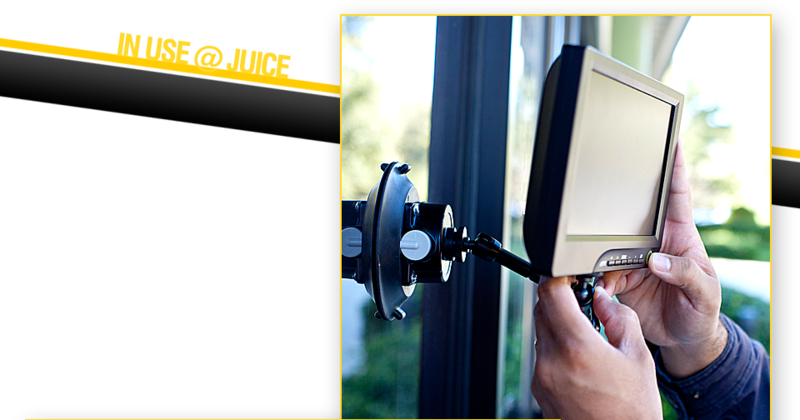 Versatile, portable, useful - see the Suction Mount Series in action! 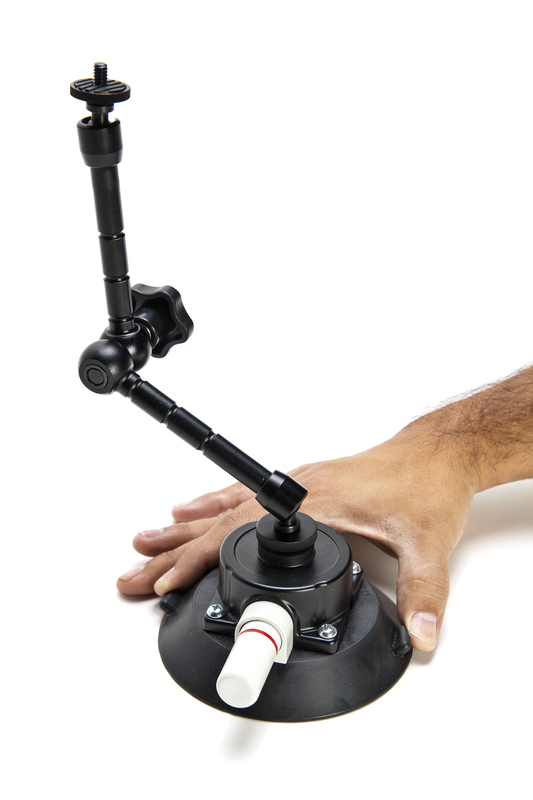 The Digital Juice Gear Suction Mount Series Articulating Arm is a sturdy, portable, jointed accessory arm that can be used to mount small displays, lights, microphones or other accessories on any flat, non-porous surface using an integrated suction cup mount. 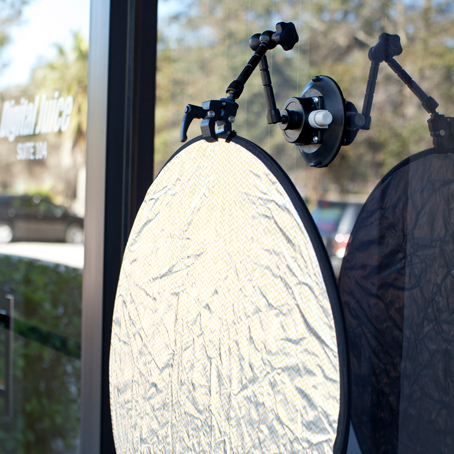 It is a perfect tool for rigging portable lights in hard to reach areas for car shoots, tight office environments or other awkward locations, without the need for bulky light stands. 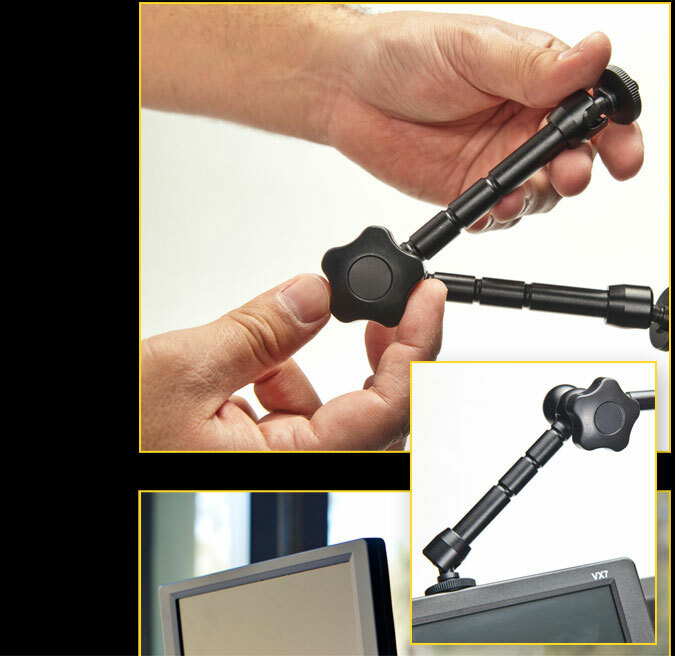 The articulating arm consists of two equal length pivoting arms on a central joint. 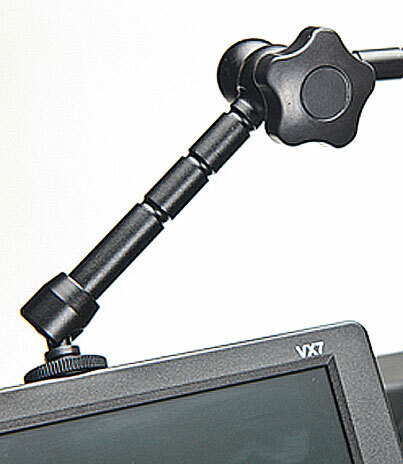 At the top end of the unit is another pivoting joint with a 1/4-20 screw mount for use in attaching any compatible accessory such as small monitors or portable LED lights. Each joint in the arm can be adjusted independently and then all 3 joints can be simultaneously locked down using the single central locking knob. 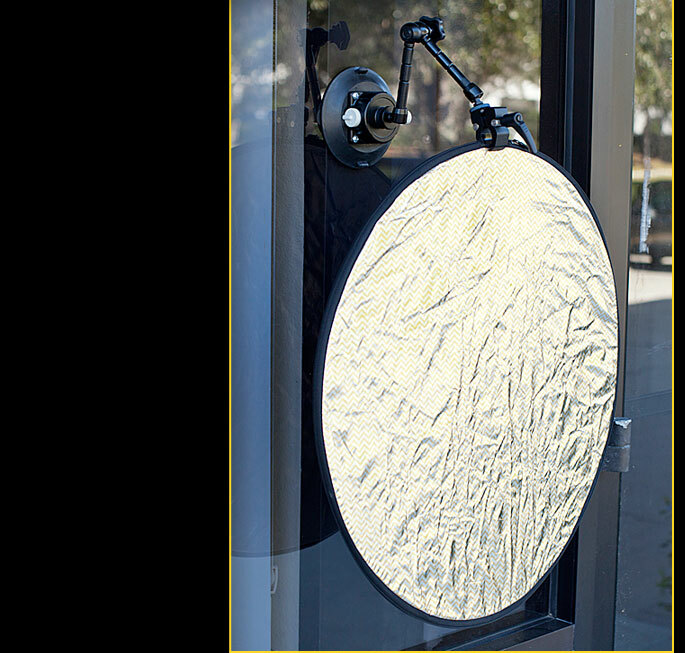 At the bottom end, the arm is permanently affixed to a 4.75" suction cup mount, ideal for use on non-porous smooth surfaces such as windows, walls or a car dashboard when shooting on location in tight spots. 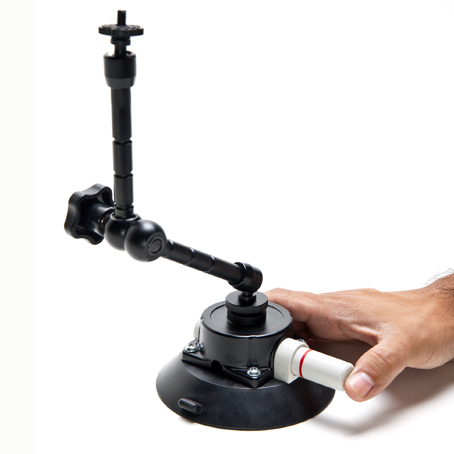 Attaching the suction cup mount to a smooth surface is very easy. Just place the suction cup where you need it and then pump the white pin until the red line on it is no longer visible. The unit will be firmly attached and ready to receive any combatible accessory. 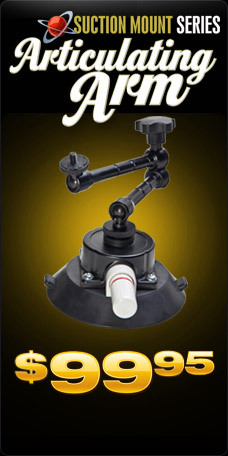 The DJ Gear Suction Mount Series Articulating Arm provides a universal 1/4-20 screw connector on a pivoting end joint so that you can attach and adjust just about any type of small accessory you might need on your next location shoot. 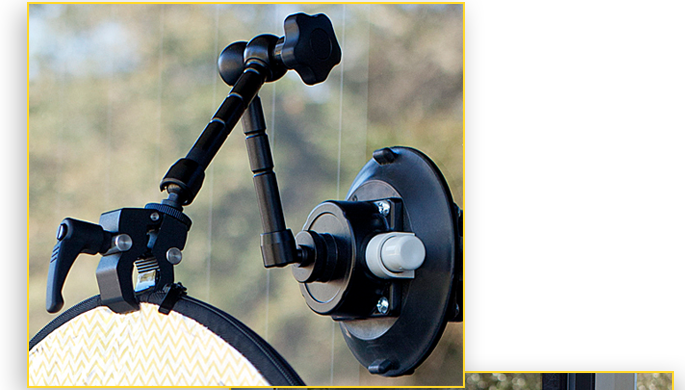 The unit provides horizontal, vertical as well as tilt adjustments for a wide variety of attached accessories. 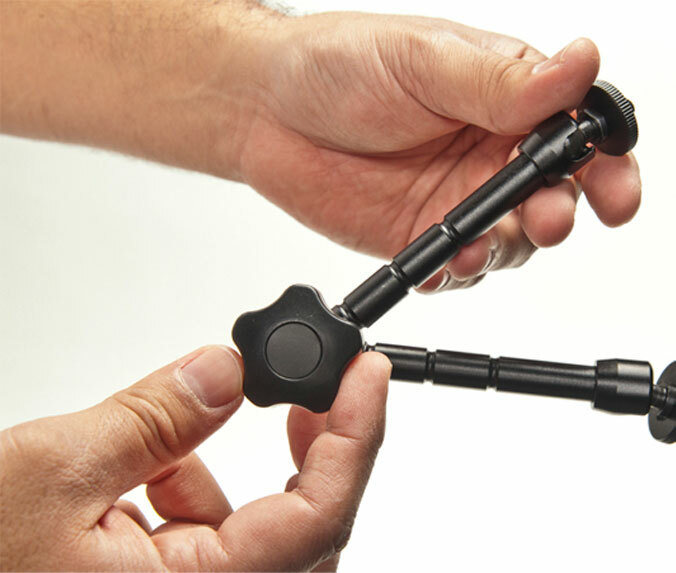 To adjust the positioning of accessories connected to the arm, you just loosen the central locking knob, adjust the position of all three pivoting joints, and then lock down the adjustment by re-tightening the center knob, which affects all three joints so they remain in the desired position. 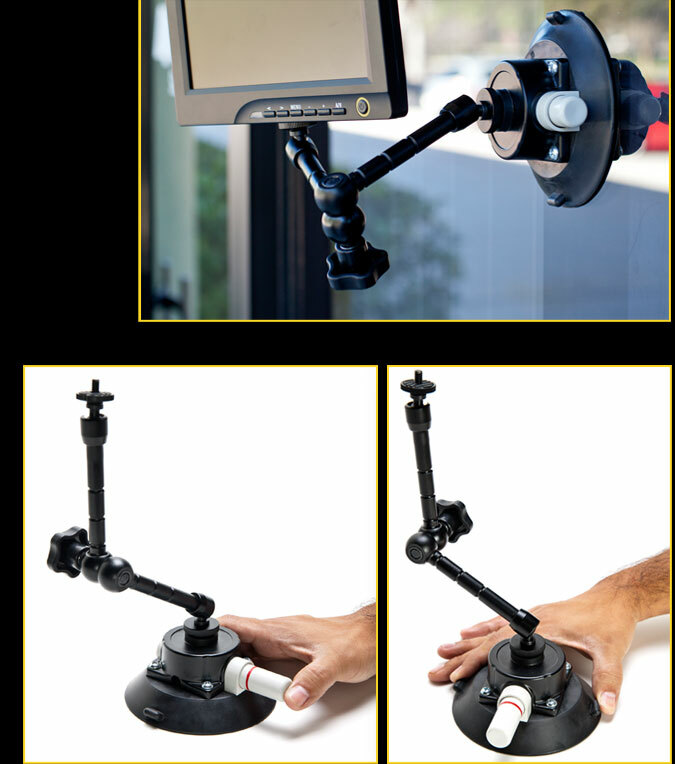 With equal length on both sides of the center locking joint, the articulating arm has better strength and balance and can hold accessories up to 5lbs in place firmly and easily. 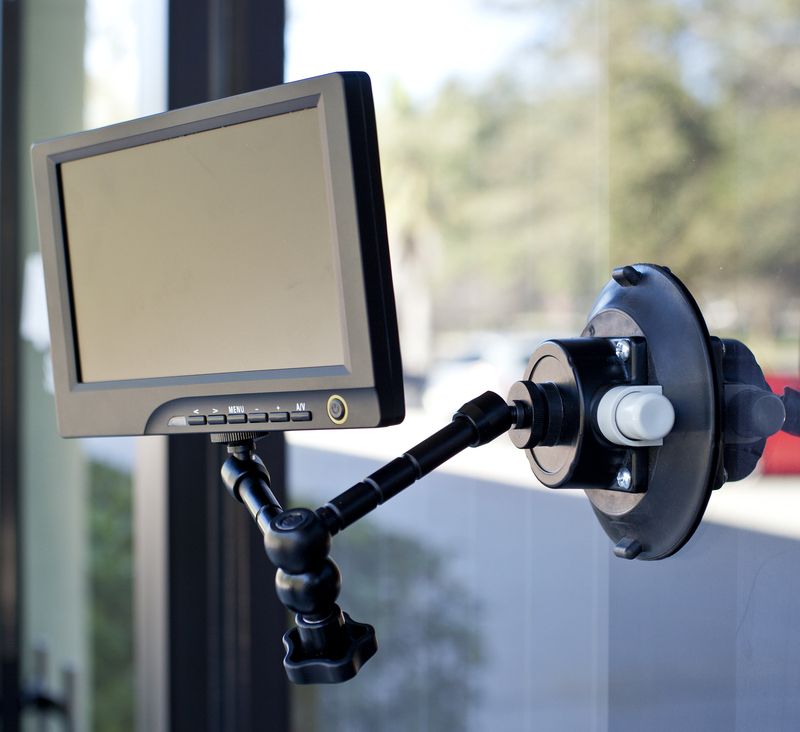 The suction cup mount on the articulating arm unit is easy to use and provides a solid, stable base for just about any combatible accessory. A few pumps of the large pin on the side of the unit, once it is placed against a smooth non-porous surface, and you are in business. A red line on the side of the pin will disappear once adhesion is achieved. Releasing the suction when you are done is as simple as lifting one or both of the tabs on the sides of the suction cup. 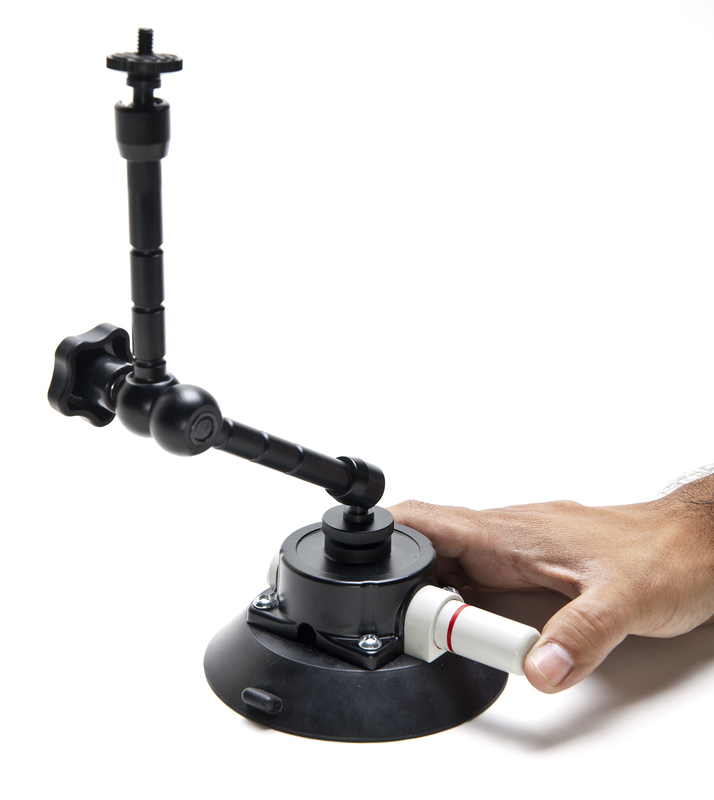 The DJ Gear Suction Mount Series Articulating Arm also attaches easily to the optional Digital Juice Mini Clamp. 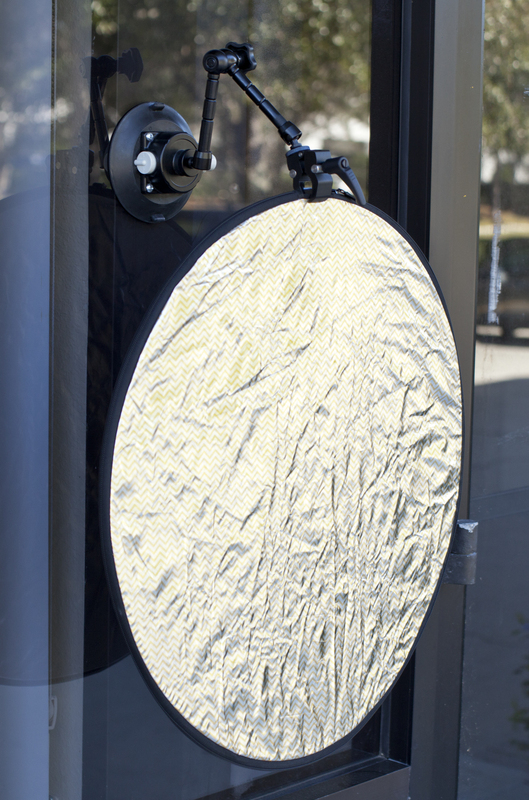 This handy and lightweight clamp allows you to attach accessories such as gels, scrims or reflectors to the articulating arm in hard to reach areas, without a C-stand, when shooting on the go. 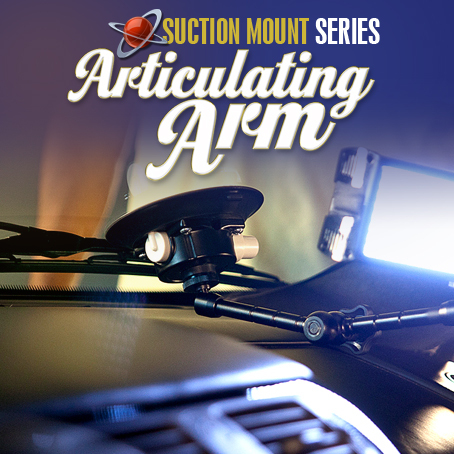 Whether you use the Suction Mount Articulating Arm as a lightweight portable accessory mount on location when you don't want to carry bulkier stands, or in the studio to hold a portable light in a tight spot, you will quickly come to rely on the versatility it provides. 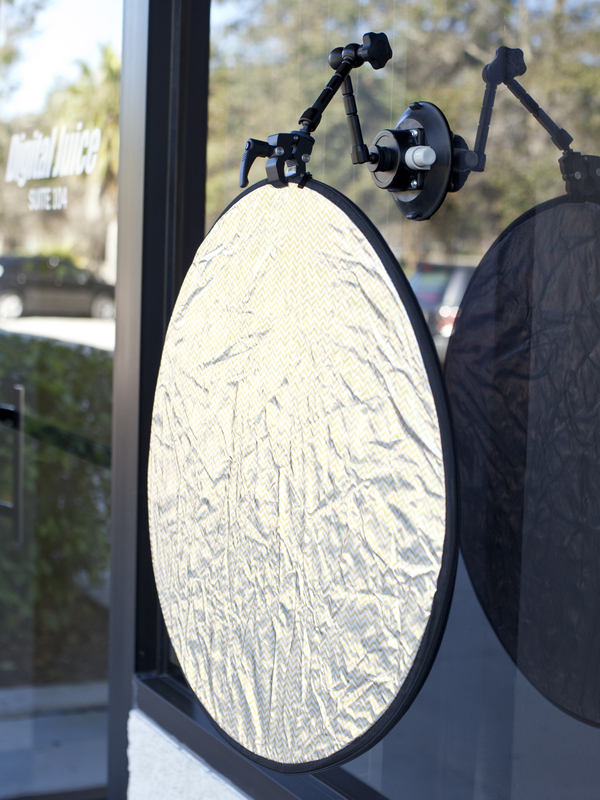 As you can see below, additional light was easily added inside a luxury car during a shoot in-studio by mounting a small LED light on the dashboard. Getting enough light inside the car to light the occupants and capture their facial expressions would otherwise have been very difficult.